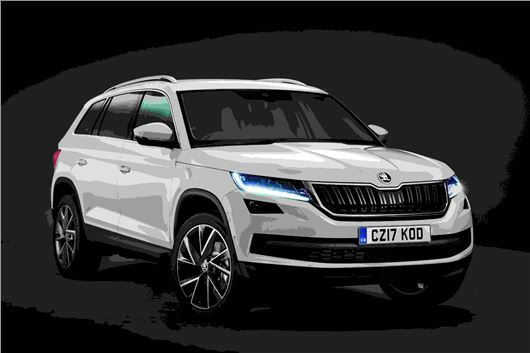 Skoda has unveiled the brand new Kodiaq in full, marking the company’s first foray into the massive seven-seat SUV segment. It gives buyers a tantalising cut price Czech-German alternative to the new Land Rover Discovery Sport, with an expected starting price of around £23,000. Available to order towards the end of 2016 and with first deliveries due in January, the Kodiaq is a picture of Skoda design restraint. There are no visual surprises, with the front and rear treatments very close to the Superb, while the overall shape could arguably be utilised by any brand on the Volkswagen Group portfolio. The pricing puts the Kodiaq close to the Hyundai Santa Fe or Kia Sorento, though Skoda will look to trump the Koreans for quality, refinement and space – the Skoda is longer than both, at 4.7 metres, with the extra room given to more boot space or legroom for the rearmost passengers. A five-seat version is available, whose total boot capacity is an enormous (and Range Rover-trumping) 2065 litres, and Skoda promises that the cabin will feel larger-than-average even for an SUV. Five engines are available from launch – two TDI diesels and three TSI petrols. The diesels are both 2.0-litre units, one with 150PS and the other 190PS, the latter capable of sending the Kodiaq to 62mph in a snappy 8.6 seconds. Completing the range is a pair of 1.4-litre TSI petrol units (125PS and 150PS) and a 2.0-litre TSI with 180PS. Fuel economy from the entry-level diesel is rated at 56.5mpg combined (131g/km CO2), while the base model 1.4-litre TSI musters a respectable 47.1mpg figure (140g/km CO2). A six-speed manual transmission is standard, with a six- or seven-speed DSG automatic optional, depending on engine. Options include adaptive damping with selectable driving modes, and although front-wheel drive is the starting point for a Kodiaq, all-wheel drive is of course available too. And for caravan types, Skoda brags of a 2.5-tonne towing ability and optional trailer assist package. This being Skoda’s biggest and (potentially) most expensive model, it comes with the best that Skoda has to offer in tech terms. Options include the company’s latest touchscreen media setup – an eight-incher incorporating wireless phone charging technology – and surround view parking cameras.